This post was updated on 23rd July - see below. Congratulations to Rachel, Sabs, Alice's Sewing Adventures, Penguin and Pear, and Batwidow! Please contact me at iwanttobeaturtle[at]gmail with your name which I will pass onto the organisers with your email address. Congratulations, Jodie - contact me as above to claim your tickets. For those you of you were unlucky, or missed entering, I can offer you a discount of £1.50 on regular tickets. You can purchase tickets here - just enter the code BAT into the promo code box. I'm counting down the days to this event and I hope to see many of you there. Few words cause more excitement in the sewing community than "Great British Sewing Bee" and there is certainly a buzz building again this year. I'm sure you've all heard that the show is taking on a new format and is going live, yes live, at the ExCel in London on 21st-24th September. The event looks pretty amazing with so much to try and fit in a single visit. A must see is the Super Theatre where Patrick Grant and Esme Young will talk tips for tailoring and dressmaking before a live sewing bee challenge takes place. Fancy trying a new skill and meeting some of the former contestants? Take a workshop! It'll take you time to narrow them down and I suggest reviewing them with a cup of tea. Want to add to your stash? You won't be short on choice as there will be over 200 of your favourite suppliers there including Girl Charlee, Guthrie & Ghani, Melissa Fehr, The Foldline and Tilly. A lover of Liberty prints? There's the chance to see some archive pieces from the 1930s through the 1970s. As if that wasn't enough they've also includeddressmaking drop in clinics to help you solve that issue preventing you finishing a piece and a made at home fashion catwalk! Check out the website for further details on all the offerings. So hands up - who wants to go? I thought so. I'm pleased to be able to offer five pairs of tickets valid for a visit on the Thursday or Friday (pick the Friday and we can say hello!) To be in the running, leave a comment below telling me which part of the event you are most keen to attend. This giveaway is open until Thursday 20th July 2017 with the winners announced on Saturday 22nd. Thank you all for sticking with me while I shared the details of how I made my wedding dress. I'm sure this is the post you've been waiting for - how the the dress looked on the day and some wedding photos. Ok, I got carried away and there are lots of photos focussing on the dress. If you want to see more of our day and the venue, visit this post by Gareth, our fabulous photographer who supplied all of the shots below. The first sighting of the dress on that glorious day in early May was when Gareth took it for its own short private photo shoot. I had asked him at the beginning to get some photos of it as I knew I wouldn't have the opportunity and thankfully he was game! He took the dress to the Cotton Quarter where our ceremony took place. This was the first time that the dress had been hung and, without the security of being on me, I was a little worried that the weight of the skirts would cause it to drop. I temporarily added a couple of ribbons to the bodice, secured with safety pins, to give some extra stability while the dress was on the hanger. I couldn't have put the dress on without help and my bridesmaids, Emily and Rachel, came to the rescue. After the waist stay and the top button were closed, we all pulled the bodice tightly towards the back to ease the pressure on the invisible zip at the waistline. Rachel closed the buttons on the back while Emily took charge of ensuring the skirt layers laid flat. It was pretty amazing to be finally wearing it! I was completely amazed by how closely and perfectly Kerry, our florist, had been able to match the roses to my dress. I also want to thank Ellie for the make up and performing a small miracle with my hair which didn't want to stay put. Amazingly the dress came through the day unscathed - no tears in the lace and no alcohol stains. Just a few small grass stains from the short walk below. This is an even more impressive achievement when you consider the amount of crazy dancing that happened during the party. We hired an amazing band, Hipster, who kept our guests entertained with a couple of hours of fabulous live music. I ditched my shoes and bounced around for the whole evening! I honestly couldn't be prouder of this make. This is the last construction post of my wedding dress! I'll cover creating the skirt, adding the bodice and the finishing touches. You may remember in the photos of the dress toile the skirt was narrow and the train rather short. I was keen to fix this in the actual dress as it felt limiting (both in style and movement) and I wanted to show off the beautiful fabrics as far as possible. With a limited amount of fabric, the width of the skirt and therefore the length of the train was determined by the width of the silk satin. At 132cm wide, the early indications were that this would be close to what I had originally wanted. At the cutting out session, we took the skirt pattern and sliced it up the middle, laid it on the silk satin and spread it as far as we could. By this time I had my shoes and they demanded an extra 8cm of length to be added at the bottom. We smoothed out the curved hem before cutting out allowing extra wide seam allowances. These would give us greater flexibility in ensuring the silk satin and lace skirts lined up neatly when they were fixed together. Cutting out the lace skirt was a little emotional. I wanted the beautiful scalloped edges to skim the floor at the front and be complete all the way round the skirt and ideally for the train to finish in a smooth curve. The lace had other ideas - to achieve the smooth curve I would need to clip the lace and add a large part by hand. This was based on the assumption that we would cut the lace length ways and piece the skirt together using applique seams. Seeing it all laid out and imagining how it would look made me realise that it didn't feel right. While I was cutting out the silk, Chris was laying out the pattern pieces on the lace and experimenting. By placing the pattern on the cross grain it was possible to cut the entire skirt in one very large piece. No side seams, no applique needed! We wrapped the lace around me to check the drape would work and I got very, very excited. Cutting this way would allow the lace to shine as it was intended. There was a compromise though - to keep the full scalloped edge it would have to end in a gentle point rather than a smooth curve. After seeing the drape of the lace, I decided that maintaining that was more important and chose to adapt the train. As an added bonus, it halved my workload! As with the bodice, the silk satin was mounted onto silk organza. When testing the fit, we took out quite a bit of excess at my hips (a standard issue for me) to ensure that we got the gradual A line. I finished the seams in both the silk satin and the lining with French seams. Alterations were needed to the lace skirt as well - we had to raise it at the waist by about 8cm and ease it into the waistline while ensuring that the lace matched up along the centre back. The back of the lace skirt was left open. Now came the most complicated part - adding the skirts to the silk satin bodice. I completed the lining first, attaching the skirt at the waistline to the lining of the bodice. 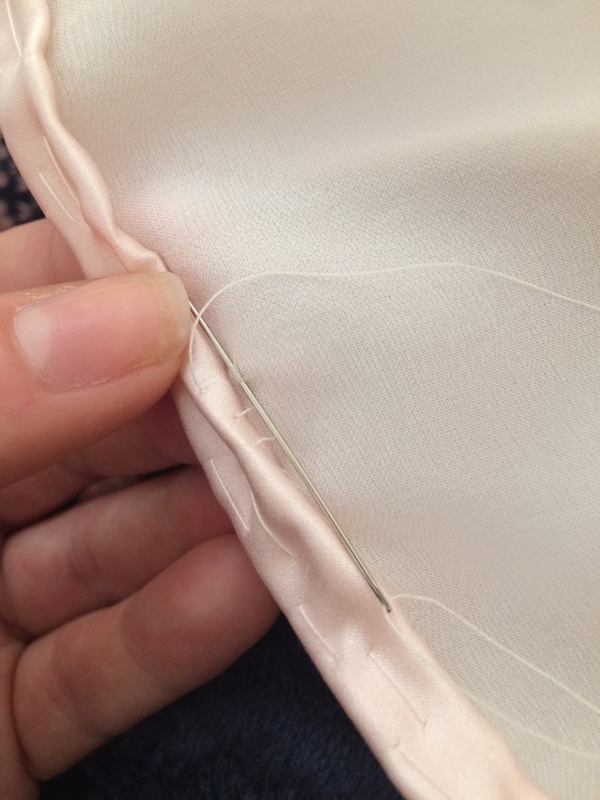 I then inserted the invisible zip to the lining and the foundation carefully keeping the silk satin out of the way. Thankfully the zip went in perfectly first time. Following this, the silk satin and lace skirts were basted to the silk satin of the bodice and stitched into place. The centre back seam allowance of the silk bodice and skirt were pressed under and slip stitched along the zip. Keeping the silk from bubbling at the bottom of the zip was the trickiest part and the thread was ripped out a number of times. The lace overlay was added next - hand stitched into place at the side seams and anchored loosely at key points along the waist line. All of a sudden, the dress had come together with only the centre back closing to add. It felt like I was on the home straight although there was still a lot of work to complete and time was slipping away. Completing the centre back required long strips of silk satin cut on the bias - somewhere between 7-8m. To minimise the number of joins, I cut the stripes as long as possible - about 70cm - before they became too distorted. I needed two strips at 3m for each of the centre back seams and enough to create about 130 rouleau loops. Despite sounding a lot, the loops were relatively quick to make as the silk turned out on itself easily and were cut to the exact length needed. To ensure everything lined up, I basted the bias strips onto each of the lace centre back seams. A quick fit revealed that I needed to let out the middle of the lace bodice as it was pulling too tight across my shoulder blades. I finished the left seam first as it was the simplest - the bias strip was stitched into place with the machine and the pressed towards the centre of the dress. The raw edge was folded under before being slip stitched into place. To keep the top and bottom openings clean, the extra silk was folded up/down and before being anchored by the slip stitching. The right side was more intensive as the loops needed to be included. The bias strip was machine stitched into place and pressed towards the centre of the dress. On the wrong side I matched up the loops to the edge of the seam allowance. The loops were added with the following pattern: 1cm between the ends of a single loop, a 0.5cm gap and repeat for the whole length of the dress - 126 loops in total. Each loop was pinned and then basted tightly into place. The raw edge of the binding was folded over and covered the raw edges of the loops and hand stitched into place. To secure the loops, they were hand pressed towards the opening and secured into place with a few tiny hand stitches per loop. Even though I broke up the hand stitching into small chunks and took frequent breaks I developed severe cramps in both my hands. Once recovered slightly, I began the process of stitching the buttons on to the left hand binding. The buttons are covered in the same silk satin and were created by Harlequin based in Essex. They were super quick, returning the buttons a few days after I sent off for them. Adding the binding, loops and buttons took three days in total - the only part of the dress I can actually put a time frame on! While the dress features 126 fully functioning buttons, only the top 50 were used to put the dress on. To fully finish the bodice, I added a rouleau loop and button to the top to help with the strain on the invisible zip. Finally, I was at the hemming stage and went to see Chris for the final time. She kindly measured the hem while I stood in my shoes. The silk satin skirt is hand stitched to the organza using the slip stitch. It is 1cm in depth, double folded and I rolled it back to ensure the hand stitching is completely invisible. The hem was very lightly pressed to remove any remaining pin and basting marks while maintaining the smooth curve of the fold. I did this over a couple of evenings as my hands still hadn't fully recovered from the loops and buttons. The lining was finished in the same way but went through the sewing machine and was fully pressed. A quick review of the dress to ensure all the basting thread had been removed and it was finally finished - five weeks ahead of the wedding. Stay tuned for Saturday's post for photos from the big day! The lace overlay bodice was the part of my wedding dress that worried me the most as it was the part that could so easily go wrong! In addition, we didn't have a plan for it until we got the lace. The reason for this is because we wanted to check the character of the fabric and also work out how to show it off to its full potential. The Shelley lace is a wonderful ivory lace comprised of a tulle base, which has been embroidered with a rich, lustrous thread to form the floral design and is finished with a light dusting of sequins. The edges of the flowers and leaves are subtly edged with a silver thread and the lace has matching scalloped edges on both sides. The tulle base makes it delicate to work with and very easy to distort the shape. To answer some of our questions about how to cut the lace, I spent an hour in front of the mirror in my partially completed dress with Chris draping a sample lace piece. The first option was to use the scalloped edge as the neckline, positioning the large design just above the scallops down my centre front and using the curved edge of the lace as the cap sleeves. It looked lovely but the neckline was very high and moving the scalloped edge down looked odd. In addition, the pattern would be upside down to the skirt which I wasn't too keen on. After a quick cup of tea to refill our ideas box, we turned the lace and added the scalloped edge to the waistline. 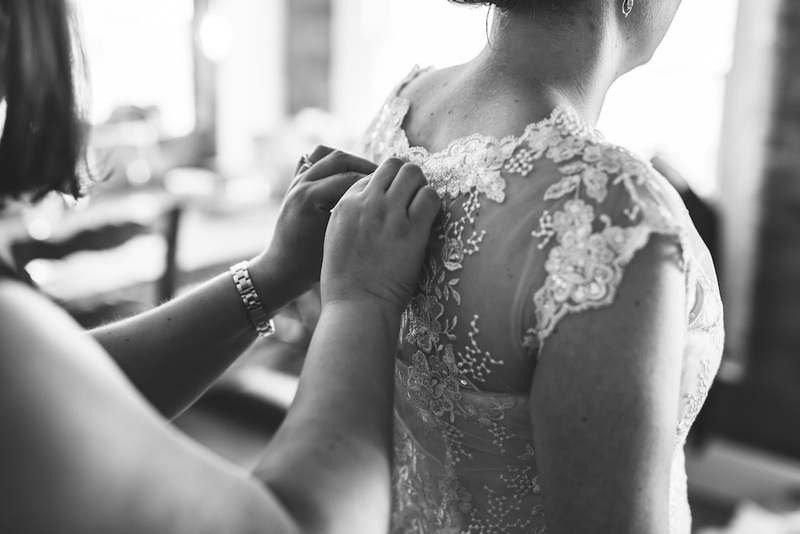 In a magical moment we had found how to position the lace to allow the full design to shine. It did actually twinkle as the sequins caught the sunlight of the fading afternoon light. The tulle base had just enough stretch to allow us to maintain the fitted look across the bust although darts would need to be added at the back as I am too hollow for the stretch to cover it smoothly. In order to have the delightful scalloped edges on the neckline and cap sleeves, I would have to stitch them on later. Creating this bodice took longer than any other part of the dress. It required a lot of concentration, careful handling of the lace so not to stretch it and so much hand stitching. Once cut, all seam lines (excluding the scallops) were stabilised with a narrow piece of silk organza selvedge and all stitching lines marked. I found that I had to complete this step in short bursts to ensure that I didn't get frustrated at the slow progress and accidentally distort the shape. Again, I basted the bodice together including the darts before heading back to Chris' for another fitting. At the fitting, we added darts to the front to pull the lace in tightly to keep the fitted look. My fears of distorting the shape had come true and we had to ease the neckline slightly to a strip of organza 2cm shorter than originally cut. We let out the left side seam to ensure it matched up perfectly with the silk bodice side seam. The final alteration was to take in the back of arms by 1cm to give a more balanced look. I used a narrow zigzag for the side seams and darts. To finish the seams and neckline, I graded the organza and folded over the lace before whip stitching it into place. So far, the bodice and skirt (details coming in the next post) had been kind and didn't require applique seams. That changed with the shoulder seams. Wanting to make the most of the lace design as well as needing to avoid bulk, I carefully trimmed around one flower on each side before laying them over the seam. The seams were machine stitched either side and the flowers carefully secured into place with tiny hand stitches. I relied heavily on Bridal Couture to ensure I was doing this correctly. Stitching the shoulder flowers was a good introduction to the hard work ahead to finish the sleeves and the neckline. Each one needed a scalloped edge added and the width of them was rather narrow. This was mainly for comfort as too much depth would have restricted movement and felt constricting. The other considerations were not covering too much of the design in the bodice and having the flexibility in the edges to allow for a smooth line. To add the scalloped edges, I placed the dress on my dress form and carefully positioned where the larger flowers should go, ensuring no more bulk was added at the shoulders and basted it firmly into place. Lots of snips into the tulle later and more grading towards to the embroidered thread to ensure it laid flat and looked like a natural part of the dress, I began the slow and somewhat tedious work of hand stitching. Again, distorting the shape of the neckline was my main concern and I chose to stitch the lace while the dress was on the dummy. This helped keep the fabric in place but it took a lot of odd positions for my arms to keep the smooth line! At this stage, the bodice was still completely unattached to the dress. In order to secure it, the side seams were tacked onto the side seams of the silk satin bodice and anchored at the waistline in key places underneath the larger flowers. The back was left free to allow for the details to be added and prevent any ruffling. If you're still with me, thank you so much for sticking around! We have one final construction post focusing on the skirt and my favourite part of the dress - the centre back details before the full reveal. 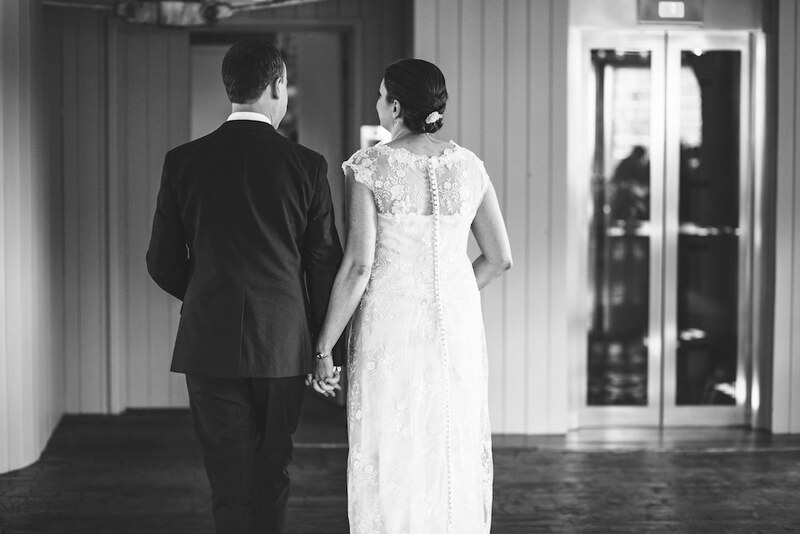 With the design of my wedding dress finalised, Chris and I set about making the pattern. We knocked out the first draft in two and half hours by taking one of Chris' standard size blocks which fitted well. From this standard block we made some minor tweaks - pinching out some excess across the upper chest and diagonally from the bust up to the sleeve, enlarged the waist dart slightly, and flared out the hip line to allow the bodice to fully close. I made a toile of the strapless bodice in calico (the overlay would wait until we had the lace) and it fitted almost perfectly just requiring a few millimetres to be removed from the front princess seams to achieve a closer fit. We added the skirt to get a sense of the full dress. The skirt toile was rather narrow with a small train which was fixed in the real dress. It did feel pretty amazing to try on the toile as it was the first real idea I got on how the dress would actually look. The rest of this post is dedicated to completing the sweetheart bodice. The bodice took a lot of patience to complete - despite being simple in design, achieving the flawless look required a slow and steady approach. Following the success toile, I began working on the foundation of the dress. It was essential to get this part right as this would take the strain of the weight of the dress. With the bodice being so fitted as well as needing to take the weight of the lace skirt and prevent any stress on the lace overlay, I needed a very sturdy fabric. I chose a closely weaved white cotton twill with very little give to provide the stability needed. In a process that would feature throughout making the entire dress, I marked all the seam lines and basted the pieces together to check the fit before committing to actual stitching. Because of the close fit and the fact I wasn't adding cups, the bodice required a lot of support. To start I stitched 8mm Rigilene boning directly onto the twill at all seam lines and the back darts. The seam allowances were pressed to one side with the boning added on top - this added another level of protection to the silk satin from the edges of the plastic. After wearing the bodice for a short time and jumping up and down a lot to imitate dancing, I realised that additional support was needed especially at the front. I added 5mm Rigilene to the front of the bodice between the princess seams up to the point where the fullness of the bust starts, two short strips placed diagonally on the sweetheart neckline and a full strip on each of the sides. Each piece of boning was covered with self made bias tape from the twill and covered all the raw edges of the seams. As it was tricky to manoeuvre the boned bodice through the machine, I hand stitched a few of these covers in place. Despite the weight of the twill, the covers didn't provide too much bulk. To give even greater security, ensure a closer fit at the top of the bodice and stabilise the sweetheart I added twill tape - I didn't want to take any chances with the lace overlay. The next step was to add the waist stay. I chose a baby blue grosgrain ribbon to act as my something blue in case I decided to take part in that old tradition. The stay is anchored to the bodice either side of each boning channel and is finished with two hook and eyes. I can recommend the clear instructions from Claire Schauffer's book if you're unsure how to finish a waist stay. The final action on the twill was to finish the raw hem. I added a light weight ivory bias tape from my stash to ensure everything looked neat and tidy. For the outer shell of the bodice, I used the beautiful rosewater medium weight crepe back silk satin. Before cutting into it, I made a change to the back of the pattern by converting the darts into seams to give a much cleaner finish. All of the silk satin pieces were mounted onto ivory silk organza to provide some stability. Again, I basted all the pieces together and mounted it to the twill foundation to check the fit. It needed tweaking ever so slightly on the front princess seams. Thank goodness for silk thread - with the amount of basting needed there was a chance the silk satin would snag slightly but this threat was minimised with a new needle and silk thread. All the silk satin seams in the dress are French seams with the exception of the princess seams. The curve around the bust was too severe for a neat finish so they were trimmed and locked into position on the silk organza with a hand overcast stitch. The lining, made from pale pink Bemberg, was completed in the same way and construction was uneventful. As a cute detail to the bodice, Chris suggested adding a narrow cord to the top of the bodice. I spent quite a long time covering a very narrow cord in the silk satin. It took so long as the silk satin kept shifting and required basting into place before going through the machine a couple of times to keep the width consistent. Adding the cord to the bodice also took longer than I anticipated as it needed carefully placing and handling. Once in place, I laid the satin shell onto the twill and stitched it into place. The seam was hand overcast into place, clipped where necessary to maintain the shape. To add the lining, I pressed under the seam allowance, basted into place, and hand stitched carefully using the slip stitch. This allowed for a very neat finish and ensured none of the lining peaked over the cord. As you can see in the photo above, I needed to add an opening to the lining to allow the waist stay to come through. Keeping with the quality of this make, I opted for a technique similar to a bound buttonhole facing. Sally did something similar and I really liked the look. I would say the holes are a little too big but their size allowed the waist stay and the dress to move naturally with me. The final step to completing the bodice at this stage was to baste all three layers together along the lower edges and the centre back seams to keep them nice until needed. Today I'm beginning to share the details of the dress in full. It'll take a few posts to get to the reveal as I wanted to share the process of constructing it. Thankfully, I had a fairly strong idea of the style of dress I wanted from the beginning. I wanted it to be full length, all the lace, fitted to the hips followed by a gradual A line skirt to allow for a elegant, flowing look. 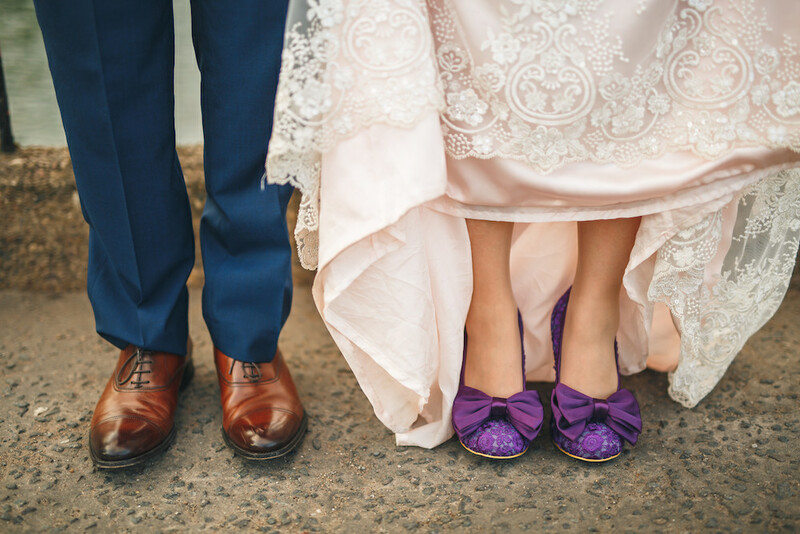 I also knew that I wanted something different from the traditional full white or ivory wedding dress - I wanted a little pop of colour but I wasn't sure what that looked like. From the extensive internet searching, I fell in love with the Adele dress by Amelia Sposa with its beautiful illusion cap sleeves, vintage lace and buttons all the way down the centre back. I also loved the illusion back although I knew this wouldn't be something I could replicate as I wouldn't be comfortable with that much of my skin on show! Before committing to replicating the style, I decided to visit a bridal shop to try on some actual wedding dresses. I wanted to be certain that I had the right design from the beginning as I didn't have time to start again if I got it wrong. In addition I wanted the experience of trying on dresses of all styles and many with a price tag I would never be able to afford! In 90 minutes I tried on about six different styles. The experience confirmed that I wanted a full lace dress. 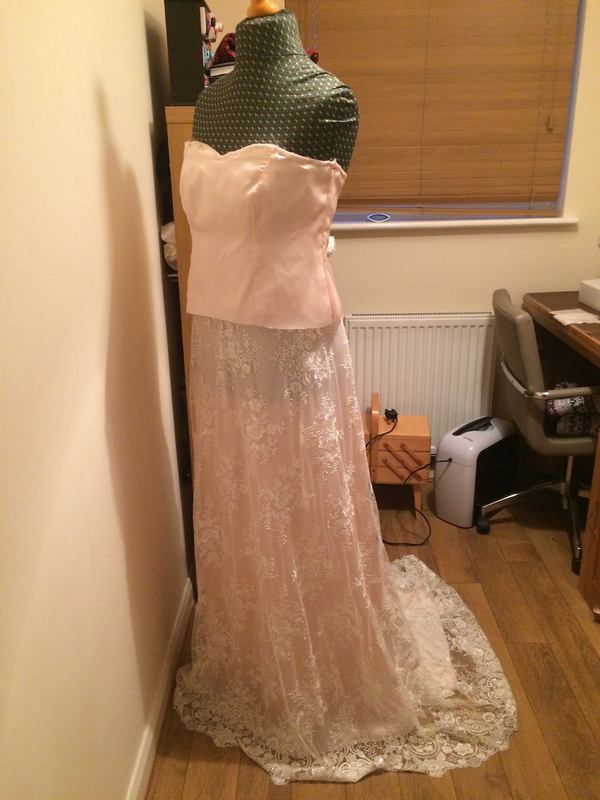 It also told me that I needed a fair amount of structure and support in the bodice, that I wanted a longer train that I originally anticipated and that the dress needed to be fairly lightweight - I really struggled to carry the heavy dresses in heels. I did find a dress that I would have bought if I hadn't already decided to make my own. That dress is Carolyn by Augusta Jones. 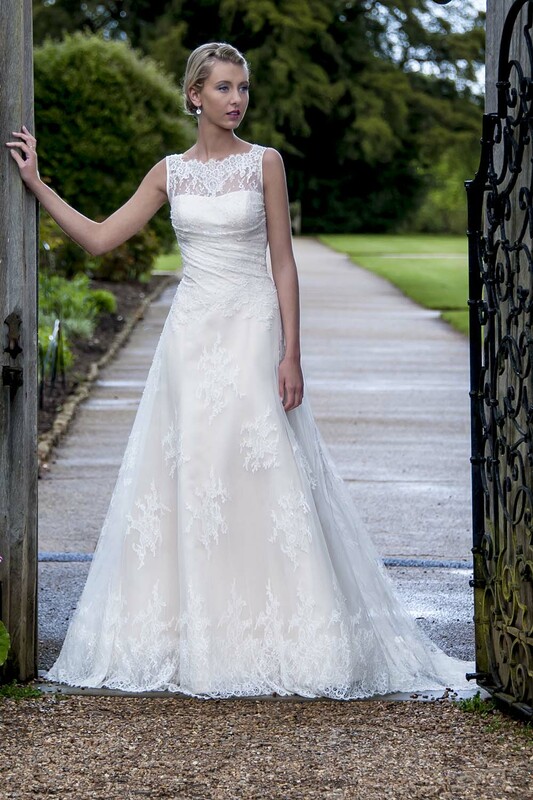 I loved the boat neck with the scallops and the gathered lace to one side was lovely and extremely flattering. The picture below is in ivory but I tried on a blush version. Perhaps the most important part of trying on this dress was that it reassured me that my instinct to include some colour was absolutely right. I took my mum, Adam's mum, and my bridesmaids with me to the shop and it was interesting to hear their differing opinions on the styles and colours - there was a strong preference for the traditional white or ivory. Ultimately I wanted the dress to reflect me - and I needed to go for something a little different to the classic traditional colours. A day or so later, I still couldn't get some of the features of the Carolyn dress out of my mind so I drew up the design which incorporated elements of both Adele and Carolyn. As you can see from the sketch below, it includes illusion lace at front and back, cap sleeves, a sweetheart neckline, and buttons the full length of the dress. The bodice is very fitted and the skirt flows gently to the floor ending with a train at the back which is perfectly curved. I wanted to achieve a simple, elegant, almost flawless look with some key details. I was sure that I would be able to make this in the allocated time and quickly started ordering samples. The trickiest part would be finding the lace as I'm sure picky with the designs. At the recommendation of Twitter, I ordered several samples from Platinum Bridal Fabrics. They have some exquisite designs throughout their site and it would be so easy to convince yourself you need the more expensive laces! At the same time, I ordered multiple samples of the medium weight silk crepe backed satin from Beckford Silk. I've ordered from Beckford before and was impressed with their fabrics. All of the samples from them were subtle colours. I then lost hours to comparing the different colours with the different laces, seeking different opinions. Eventually I paired the rosewater silk satin with the Shelley lace and knew I had my combination. Stay tuned for the next post which provides detail of the pattern and constructing the bodice. You’re making your wedding dress, right? You may have noticed that things have been a little quiet in this corner for a few months. There is a very good reason for this - Adam and I got married in early May! The day was just wonderful - the best day I have ever had. Our family and friends were good enough to join us in Derby so Adam's grandpa could be there. 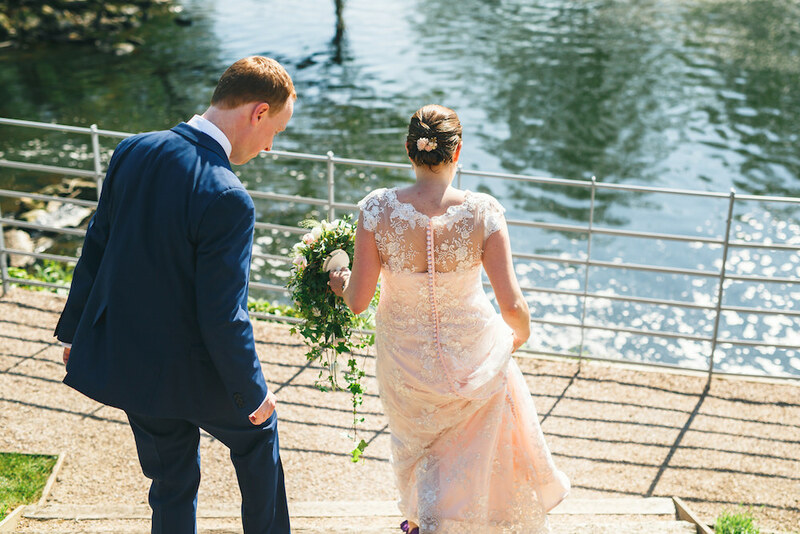 We booked the fabulous West Mill as our venue and it couldn't have been more perfect or more fitting as it is a converted cotton spinning mill! Some of the floors are appropriately named - you get married in the Cotton Quarter and party the night away in the Spinning Room. It truly is a magical place. I hope you don't mind me indulging in a few posts about this day and its handmade elements. I'll start with my wedding dress as the professional photos are almost ready so it shouldn't be too long before the big reveal! Today I want to discuss the one question which follow the congratulations for any sewer - "will you make your wedding dress?" I thought it might be interesting, and hopefully helpful to those considering this question, to share some of the factors in my decision to make mine and some useful resources and tips I picked up along the way. We'll get to the actual details of the dress in the next post. It is a tough decision to make at a time when you are making hundreds. Organising a wedding of any size is a big undertaking and when you add in the dress making process, it has the potential to become completely overwhelming. I can get so excited that I can make creative decisions without really thinking about them in detail. So while I knew, very deep down, that I would ultimately be making the dress, I forced myself to pause for a couple of weeks. I used the time to carefully think it through, to research and to read about other people’s experiences and ensure this was the correct decision for me. Without doubt, this was the biggest factor for me to consider. We’ve all been there when a project that is taking longer than anticipated. A wedding dress is one of those projects. You need to give yourself as much time as you possibly can especially as you’ll need to build in time for research, receiving samples, fitting, and practising techniques with your selected fabrics. 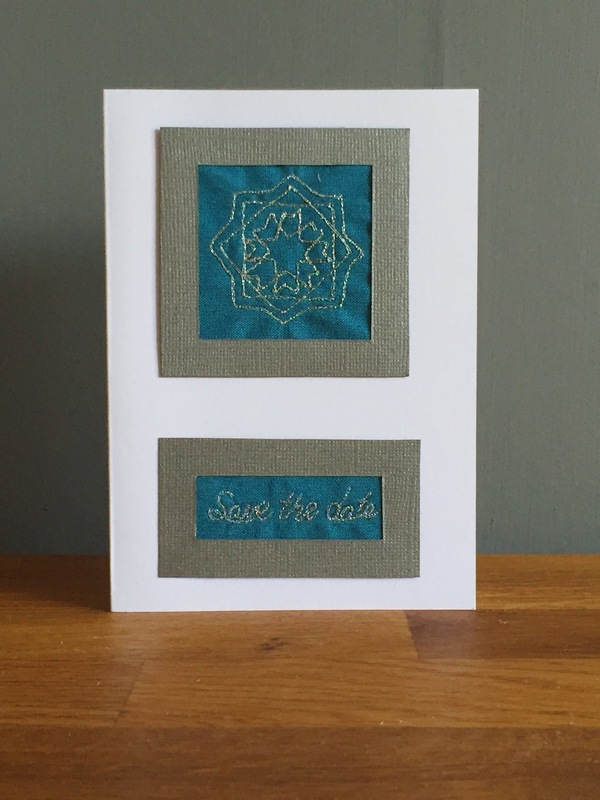 I’d really recommend giving yourself that extra month or two – essential if you have the Christmas break in the middle or you’re considering extensive amounts of hand stitching. I had eight months from booking the venue to saying “I do” and I was seriously concerned that this would be too short a time. I didn’t want to be putting the finishing touches to the dress the week before the wedding. So I set a deadline and worked backwards. I started the dress at the beginning of November and finished towards the end of March. If I had my time over, I’d have started at the beginning of October as I felt the pressure a little towards the end. This next tip may sound obvious but it is something that I forgot at times during the winter months. Set your sewing time to allow you to enjoy this process. Build in enough time for short breaks to allow working in chunks and step away when it is becoming a little much. I found my full day sessions were much more productive and enjoyable when I paused fairly frequently. I also avoided late night sessions and doing too much when I was tired as this is not when I do my best work. This is also worth taking the time to think about and it was one area that Adam asked me to consider. He was worried about the additional complexity and to do lists and therefore potential stress that this undertaking might bring on top of organising a major event and balancing a prolonged busy period at work. What would happen if it all got too much and mistakes were being made? How would I deal with that? I had locked him out of the process as I didn’t want him to know anything until the day. My answer - a sewing support network. Adam had raised a very fair point. If it all got too much, he would be on the front line but without the details and the ability to help. I filled this gap with a few close sewing friends who were only too happy to answer questions, act as a sounding board, or calm me down over whatsapp. I’d recommend having at least one other person who understands the craft that you can turn to for help and support. While Hannah, Leire and Kelly did a magnificent job, I decided to take this one step further and ask a professional to act as a partner/consultant. I’m extremely fortunate to know Chris Eady, a local freelance designer and pattern cutter. I met her a few years ago when I took one of her pattern cutting courses and stayed in touch. Chris is a wonderful, patient, extremely generous and talented woman and I knew she would be able to guide me through the process when I got stuck, point out techniques I hadn’t considered, and hold me to a high standard! It’s not an understatement to say that she is one of the biggest influences on my stitching – my makes dramatically improved after meeting her and it only seemed natural to bring her on board. Going down this route won’t be an option for everyone, nor is it something what you might want to do, but it worked so well for me and it’s only right to give Chris the recognition she deserves in this story. This was an interesting issue and one I didn’t think about until I had started. I don’t have a dedicated sewing room and as I had decided that I didn’t want Adam to see the dress before the day I needed to be creative. I ended up working mostly in our study and banning Adam from going in there. While I managed fairly well, it wasn’t ideal as the room is small and quite cramped. If you can, use an area that is spacious and is somewhere you can leave set up to continue working. Cutting out at home was impossible so I hired a room in a community centre for a couple of hours. My rather cramped sewing conditions for the dress. Although it is amazing what you can make in such a small space! Also make sure that the space is easy to keep clean and tidy – you don’t want to find your snips or your cup of coffee perilously close to your fabric (slightly ashamed to say this happened with alarming frequency). Bridal Couture by Susan Khalje. This really is the couture wedding dress bible of its reputation. I found it particularly helpful to understand fabrics (especially lace) and handle them and how to construct the dress. As you'll see from future posts, I didn't add a corselette but the content of this book was super helpful as well as incredibly interesting. Couture Sewing Techniques by Claire Shaeffer. The perfect companion to achieving a high quality finish. I used this book in a hand holding exercise, even on techniques I knew well! Happy New Year! I hope you all had a wonderful break over the holiday season. I'm just finishing up a 12 day holiday and it has proved to be a lovely time with family and friends - exactly the tonic that I needed. Like many at this time of year, I can't help but become a little more reflective as well to think about plans for the forthcoming year. I'm approaching 2017 in a slightly different way. I'm not making resolutions or making any grand public goals. Instead, I plan to focus on wellbeing. The end of 2016 was tough for me with my mental health and I practically lost the ability to do anything other than work and collapse on the sofa in the evenings and at weekends - a lot of things went on hold. Concentrating on wellbeing in general seems to be a sensible way forward, a way for me to enjoy the year and I've noticed that some things are already starting to get to normal. I start a Cognitive Behaviour Therapy course tomorrow for a month and I'm looking forward to seeing how it might be able to help. I'm also looking forward to the return of my creative side - it's increasing and the itch to hold fabric is there more often! It began to return on and off in December and I managed a few projects - two Buchanan dressing gowns for gifts which I didn't get photos of, a Grasshopper dress for me (post coming soon! ), began making good progress on my wedding dress and made six, yes, six Sewaholic Stanley Christmas trees! If you haven't made them yet, I would recommend them as a fairly quick project. I had a lot of fun making them. They are straightforward to make but if you're making many at once, you may want to break up the process a little. Clipping all of the curves for six trees at once was a little tiresome as was the hand stitching to close them after stuffing. The fabric comes from Darn It and Stitch and they aren't traditional Christmas prints. I particularly love the gold which is seasonal only with the doves amongst the flowers but it makes a fabulous tree! As none of the fabrics had a directional print, I managed to get two trees from a metre. They are all finished with either cream or red satin bows from Hobby Craft. After browsing the web for some inspiration from other fellow stitchers who had made these, I decided I wanted a fairly plump look to the trees and was surprised at how hungry they are - you will use a lot of filling for six trees! I found it easier to add a little filling to the tips of each side of the trees before filling the rest. A slim pencil was perfect to help push the filling as close to the tip as possible for a nice, even look. I gave three away as gifts and the others are currently in our lounge. I will definitely be making more of these for future Christmases - there are a number of family and friends who didn't receive one this year. Oops, I may just have given away some of next year's presents!